If you think photography is easy as snap, think again. Anyone can be a photographer, thanks to the numerous options that digital cameras provide. But it takes a combination of hard work, talent, creativity and luck to make it as a photographer. If you love puttering around with your camera, snapping up pictures and experimenting with different styles, you may be considering turning your passion into a profession. 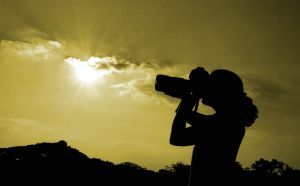 To do this successfully, you need to first know how to break into the field of photography. Gaining a toehold is important in an industry where only the best make it to the top, so you need to plan your entry with great thought. Start early: A head start is good in any situation, and when it comes to becoming a professional photographer, the younger you start, the more experience you gain. If you‚Äôve always loved taking pictures with your parents‚Äô camera, save up to buy equipment of your own. Volunteer for school and local community projects. Start a business on the side, and make your USP the fact that you charge significantly less but do as good work as the pros in the business. Work hard at your assignments and do your best to impress clients. It‚Äôs easy to keep a fledgling business going when you have customers who offer their continued patronage and also recommend you to their friends and family. Go to college: While some people may think that a college degree in Fine Arts or Photography is not a necessity, others feel that it helps open the doors of opportunity, especially if you‚Äôre enrolled at a prestigious school. Placement cells provide you with job openings as interns or assistants and you also develop a network of contacts which is useful in furthering your career. Have a complete portfolio: Any photographer worth is salt knows that without a portfolio, they are incomplete. They are never going to be taken seriously if they do not possess samples of their work that showcases their style and the kind of work they do. So get started on creating a portfolio, if you don‚Äôt already have one. Choose a niche: There are various kinds of photography, so you need to choose the specialty that you think is best suited to your skills and in which you have a relatively good chance of success. I‚Äôm sure all of us want to become fashion photographers, but it‚Äôs best to be realistic and choose a field that is more practical and one in which you can break into easily. Look for positions as assistants or interns in your chosen niche, and work your way to the top from there. It may be difficult to get people to take you seriously at first, but when you let your work do the talking, you‚Äôre well on your way to success.